Wonderfully silky, this paraben-free formula applies like a rich creme and performs like an oil to give you the performance benefits of both textures in one. This formula offers higher friction and less glide than oil yet it won't absorb as fully or as fast as lotions. 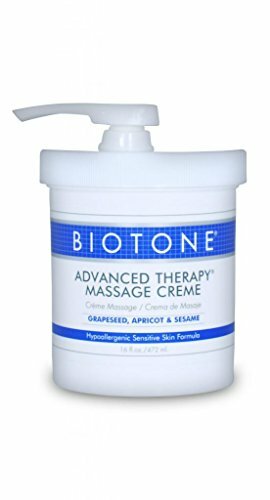 Advanced Therapy Massage Creme offers therapists the unique combination of effective lubricants with nothing to irritate even the most sensitive, delicate skin. Sensitivity tested and proven safe, this formula contains no drying alcohol, mineral or nut oils or strong fragrance so you can use it as frequently as you'd like. Advanced Therapy Creme is based with skin Apricot Oil to soften skin, Grapeseed Oil for its exceptional light texture and non-greasy finish and Sesame Oil, which sooths and moisturizes all skin types, and can aid eczema and psoriasis. If you have any questions about this product by Biotone, contact us by completing and submitting the form below. If you are looking for a specif part number, please include it with your message.